For main characters Joseph (Peter Mullan) and Hannah (Olivia Colman), salvation is found in each other’s company. Joseph is a sad, lonely widower, prone to drinking and outbursts of violence. He hates himself, and the only way he knows how to take out his aggression is on others, either verbally or physically. After one depressing night at the bar, he runs into a small thrift shop, desperate to hide from the world. The cashier, Hannah, notices him crouched behind a clothes rack, and when he won’t talk to her, she decides to say a prayer for him. Hannah has little to be happy about in her life. She wants nothing more than to be a mother, but she cannot bear children; she lives in a posh, upper-class neighborhood, but she fears her home, where her abusive husband beats her. Hannah retreats into religion and good works, doing kind things for others and praying regularly in the hope that one day she will be rewarded. Surprisingly, Joseph may just be her salvation, and Hannah his. “Tyrannosaur” is never thematically overt, but I took away a message of acceptance, that all are deserving of happiness, from a cold man like Joseph to a good woman like Hannah. But it also hammers home the point that all people, be they regularly good or bad, are capable of doing terrible things, bad deeds that limit what they can achieve and how happy they can be. If life were fair, Hannah would be deserving of a savior better than Joseph, and Joseph couldn’t hope to befriend a woman as good as Hannah; in a perfect world, Hannah wouldn’t be pushed to an extreme, life-shattering moment, and Joseph wouldn’t find release in violence. But the world isn’t perfect. At the end of the day, Joseph and Hannah are just people, not bad or good, but merely human, and the slice of happiness they carve out for themselves in each others’ company may be the best God can do for them under their present circumstances. As brutal and unflinchingly dark as “Tyrannosaur” often is, I can’t help but smile when I think of that core theme. There’s something undeniably life-affirming about something so simply, fundamentally good rising out of such impenetrable darkness. What an amazingly accomplished film for first time writer/director Paddy Considine. An acclaimed British actor, I’m only familiar with his minor roles in “Hot Fuzz” and “The Bourne Ultimatum,” but “Tyrannosaur” is undeniably the effort of a man born to be a filmmaker. The script is a thoughtful, engaging construction, and Considine directs with the confidence of a pro. Not only does he have a total mastery of the frame, but he understands how to use color and lighting to create the perfect atmosphere for each scene. 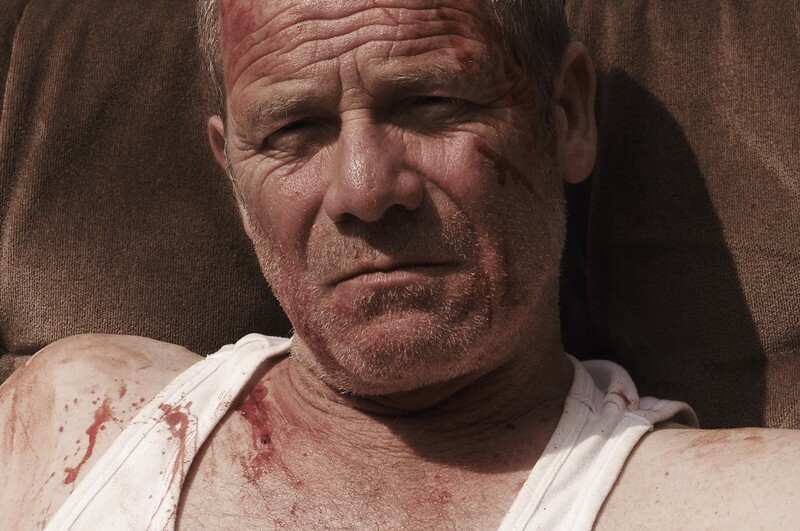 Most importantly, Considine’s experience with acting shines through from behind the camera: “Tyrannosaur” is a film driven by performance, and here, he directs his leads to do truly incredible work. Peter Mullan, best known to American audiences for his memorably portrayal of Yaxley in “Harry Potter and the Deathly Hallows,” is simply devastating as Joseph. This character can be cruel, aggressive, mean-spirited and selfish, but Mullan allows us to see Joseph’s heart and soul while never shying away from or toning down his darkest qualities. I found myself caring deeply for this man, even as I hated so many of the things he does. Mullan gives a speech in the film’s second half that simply knocked me out, one that expresses all the infinite complexities of this character in just a few sentences; somehow, we come out on the other side caring for him even more. 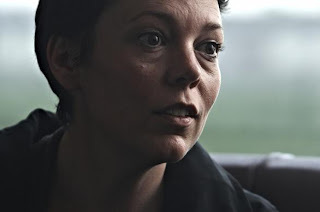 Olivia Colman is every bit his equal as Hannah. It’s a lot easier to care for this character, obviously, but that means she causes us quite a bit more grief as we watch so many bad things happen to her. Colman understands the nuance require to play a victim of abuse, illustrating the constant struggle between Hannah’s damage, fear, and strength. She’s a simply fascinating character to watch. Colman and Mullan have amazing chemistry together, and since “Tyrannosaur” is primarily a quiet character study (albeit punctuated with moments of brutality), they carry the entire film on their shoulders. They do an incredible job, and the film works in tandem with their talents. 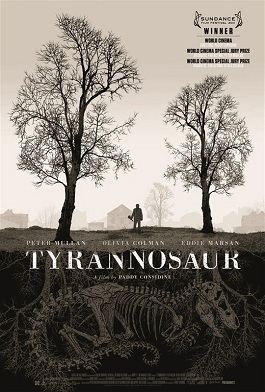 “Tyrannosaur” is a triumph for all involved. I will certainly follow Considine’s work from this point forward; if he can deliver something this powerful in his first film, then there’s no telling what lies in his future. Should casting agents see the film, I suspect we’ll be spotting Mullan and Colman in many more movies, and I’m eager to see where their careers go from here. 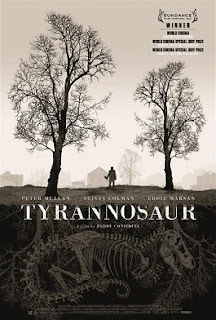 In the meantime, I suspect that I will continue to ponder “Tyrannosaur.” It is a film that lingers, and I like it a little bit more with each passing second. I instinctively gave it an A-, but I could feel more generous this time tomorrow. It is one of the best films I have yet seen at the festival, and I highly encourage readers to check it out tomorrow evening at 8:45 PM at the Denver Film Center on Colfax. If you can’t make it then, look out for a theatrical release in the future; it will start a limited rollout on November 18th, and if it makes its way to Denver, I highly recommend taking the time to see it.